Master Chess is a classic chess game with all the rules. There are 3 game modes: against the computer, player vs player on one device, player vs player online. 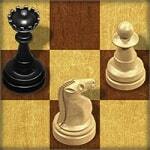 Defeat your opponent and improve your chess skills!